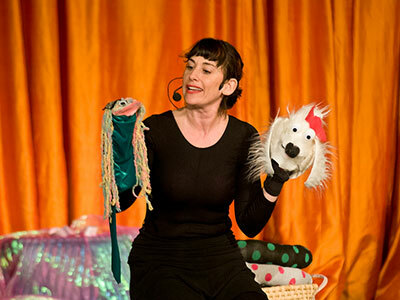 ArtsRock brought a tale of a magic orange and other stories to a sold-out crowd at the Nyack Center Sunday for its third annual puppet festival. The event included a performance by Rick Lyon, the puppet designer for the Tony Award-winning "Avenue Q" musical and a former puppeteer for "Sesame Street." Lyon performed his show "The Magic Orange" on a puppet stage, then he repeated part of his performance with the puppet stage's covers removed to show the audience of 225 adults and children how hidden humans control their puppets. Kenny Kaufman of Port Chester appreciated the behind-the-curtains view. "Young Peter here wants to be a puppeteer," Kaufman said of his step-son Peter Sortire. "and for the Sesame Street guys to open up and show how the magic is done is really special." ArtsRock also invited local puppeteers to participate. Puppeteer Skye Leith performed with his group Cirkus Fiasco and Jill Liflander of Jilly Puppets in Sleepy Hollow used a giant eye for part of her show. Unlike Lyon, Leith's crew and Liflander were not hidden behind screens or curtains. Liflander explained that puppetry challenges children when human beings are visible. "The child has to use their imagination at the same time that they're perceiving their reality," said Liflander. "I think that combination, the duality of that for the child, makes for a mysterious and wonderful experience." ArtsRock is a nonprofit organization devoted to increasing Rockland County residents' access to professional arts and multicultural programs. The group's upcoming shows include a live performance Feb. 2 of Carole King's Tapestry album along with an appearance by Doug McGrath, the writer of the Tony Award-winning "Beautiful: The Carole King Musical."